I was a child of the 70’s when there was a recession in the land. Many kids came from broken homes and many others had both parents working outside the home. In one way, these kids were alike in that they had to basically take care of themselves until a parent was available. This was exactly how I grew up. My parents were together until I was thirteen; my dad worked nights and slept during the day, so that didn’t really make him “available.” My mom worked in downtown Houston, Texas, an hour commute from our home. We didn’t have a car; gas was too expensive. Instead, we had the company vanpool van for which my mom was the driver. That meant she left home at 6 a.m. and arrived home at 6 p.m. So, I was home alone from 6-7:10 a.m. to basically get myself ready for school, eat breakfast and get to the bus stop. I locked the door with the key I wore around my neck. I knew lots of kids at school that had this sort of necklace. I guess you could call it a statement piece. Our family of three lived in an apartment and because my mom worked all day and we were busy on the weekends, she didn’t exactly have any friends popping over for a visit. Television ruled the evenings; movies and the mall reigned supreme on Saturdays, and we cleaned the apartment on Sundays. We weren’t church attenders, though I made my stuffed animals watch church on television every Sunday. I thought it would be good for them. Sometimes I would accompany a friend to Sunday school, but it wasn’t a routine thing for my family or for me. This spiritual aspect of motherhood wouldn’t happen in my story until I was thirteen years old. I watched the comedies and learned so much from them, absorbing their lessons each week. I paid close attention to the mothers and the family dynamics. For me, Florida Evans, Mrs. Cooper and Ms. Garrett were mothers that I wanted to be like. Sure, I loved my own mom. She sacrificed her dream of being a stay-at-home mother to help put food on the table, provide a roof over our head and buy clothes for us. When she was around, she was available emotionally; always with a listening ear and an honest, encouraging word. I loved that about my mom. I still do. But these television moms showed me a part of motherhood that I didn’t always get access to. I saw how a stay-home mom cooked for her family, was there for her husband and kids and had lots of friends. There was laughter, the “Good Lord,” a little Bible reading and prayer in the Evans family. Our family didn’t have much of that, mostly because when we were together, we were usually heading to a movie or to the mall or I was playing with neighborhood kids. Mrs. Cooper was most like my mom; she even had the red hair. She was always emotionally present and did what she had to do for her girls. And then there is Ms. Garrett; even though those girls weren’t her biological daughters, her love for them and her nurturing and caring for them was exactly like that of a biological mother. Each of these characters showed me different traits of motherhood and womanhood and how both are really all about relationships. That’s what it really comes down to. Even though my own mother was only around a few waking hours each night, we had a relationship. We talked. Her mothering role may not have looked like what my friends had with their mothers nor did it resemble anything I had seen on television, but I watched and learned from her as much as the television moms. When I was thirteen, my folks divorced. My dad got custody of me and sent me to the small own where his parents lived. I loved them dearly. They enrolled me in a small, private Christian school where I made good friends and thrived. My grandmother had to play the mother’s role then, which was a difficult adjustment. Looking back, I know it was just as difficult on her as it was me. Before, she had been the grandma who spoiled me, but after I moved in she had to be the authoritarian. Fortunately, we had a good relationship from my earlier years, so it wasn’t too bad. My aunt eventually moved closer and I learned some housekeeping and cooking skills from her. I had teachers at the school that mentored me in spiritual matters and I made friends whose moms were active in their church and the small community where I lived. All of these gave me new aspects of motherhood to learn from. I knew I wanted to be a mother since I was very young. I knew that being a mother didn’t’ require one to necessarily have biological kids. Motherhood is something bigger than me. It is transcending. I believe as women we are all capable of mothering. We have the inherent traits because we are created by God in His image and as the Bible teaches, “He created them in His image, both male and female.” This God is a nurturing, caring, life sustaining and relational God. He fathers and yet, He also mothers. I met my husband in a church college group while attending University of Texas at Arlington. He went to Dallas Baptist University and was a minister to the seventh grade at the local mega-church where we met. When we married two years later and became youth pastors at a small church in a small town, bought our first house and started a family. As a new mom in the 90’s in our tiny town and even smaller church, I was the token “young mom.” Because my husband and I were youth pastors at the time, I had an inside track to these teens’ families. I learned from veteran moms who were now “moms of teenagers.” I watched how they modeled motherhood and womanhood. I observed family and community dynamics. And I listened when they talked about the pitfalls of parenting. My husband and I took a parenting class and read books. Honestly, I had access to so many voices that I had to somehow tune some of them out just so I could hear what God was wanting to say to me about my kids and our relationship. Because of my learning style, my childhood experiences, the TV moms, my own mother and those who acted as mothers in my life and how all that related to becoming a mother to my own children, I can only pray and hear from God concerning the “HOW to be a mother.” My kids aren’t scripted television characters. And God knows my kids better than I do. He knows me better than I know myself. He knows what my kids need from me. If I ask Him, He answers and I can be the mom He wants me to be and the mom my kids need me to be. Of course, I’m human and I make mistakes. But for the most part, I’ve gone after the heart of my children. I’ve kept communication lines open. . I know they are on loan to me from God and I trust Him with them. 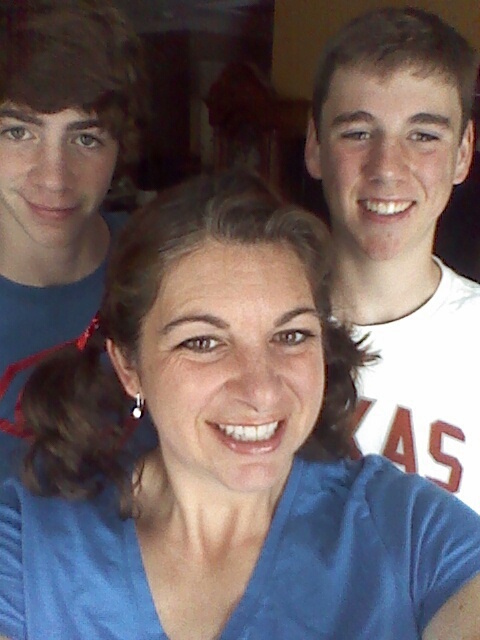 I have been blessed to be a stay-at-home mom for most of their eighteen years. I have enjoyed every stage of childhood and my role as mother during each new season. I think the most difficult stage is the current one we are in: learning to transition from parent to friend. Yes, my sons are becoming my friends. They are a delight to me. Because I’ve become so accustomed to looking out for them and tending to their needs, I now have to learn how to let go and trust God with them in a different way than before. It’s an awkward change at best and I still learn from those who have gone ahead. Currently, I’m being “mothered” by women who are now empty nesters, first time grandparents and grandparents eight times over! These women encourage me with their stories, their prayers and their interest in my family. I’m now able to also listen to other moms and encourage those who need a mother or mentor in their early childhood years or their kids’ “tweenager” years. As I noticed at a young age, mothering is about relationships. Our relationship to God, our world and each other plays a vital role in our children’s lives. They will watch, learn from and model those relationships. I believe at the heart of the role of a mother is relationship. It is all that matters. What a beautiful, inspiring story. Thanks for sharing your life with us. Love this story. It blessed me so much. WOW I learned more in this story than all of the years spent right next to you…thank you so much for sharing! inspired!!!!!! Thank you for sharing this story. How inspiring!! What a touching transparent remembrance. Thank you.